First customer of the AW169 helicopter landed in the UK for the first time on Thursday 11th February– arriving at Redhill aerodrome at 13:57 GMT. Finmeccanica, through its Helicopter Division, handed over to Specialist Aviation Services its first AgustaWestland AW169 new generation intermediate class helicopter. 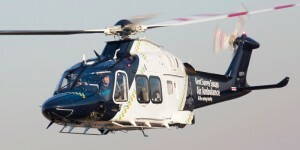 The helicopter is also the first to be delivered to a UK customer and will enter service with Kent Surrey Sussex Air Ambulance following installation of an advanced medical interior by Specialist Aviation Services.